I can't believe how quickly Mason is growing up. Maybe it's because I'm older and time is flying by or the daily schedule or work, eat and sleep has made life just pass by in a blink of the eye. Since the doctor recommended starting solids when Mason was 5.5 months old I was excited to receive the Baby Trend High Chair in the Evergreen print. Assembly was pretty easy and quick as I did it right after dinner before Kenzie's bedtime. I do have to note that no actual tools were needed. She even brought over her tools to help make it for Mason. The instructions were clear and easy to follow. There are so many features packed into this really clean and basic seat. You can adjust the height to 6 positions just by clicking up on the red bars on both sides of the A frame. Kenzie likes Mason to be on the lowest so he is on her level and she can tease him. She also likes to climb in on her own (although she didn't like a highchair herself when she was a wee one). This is a nice feature because you can pull it up to either a dining table, counter, etc. depending upon your home. There is also a 3 position seat recline to accomodate younger babies and/or feeding/play time. I started off with the full recline but Mason seemed to want to sit up to have more access to the tray and the middle position when eating. I can pull the high chair up to the dining table when we are eating dinner and Mason can feel like he's in the loop. I keep the large wheels unlocked so I can push it back and forth if he becomes a bit fussy and I still have to eat. I like the free folding feature because it can be stored upright next to our fridge when not in use. Although we've moved into a larger home, there still is not quite enough room to keep a highchair out. The dishwasher safe tray is large and does require both hands to put on and remove. I wish it only took one hand but I guess it's a compromise. Mason likes to toss his toys to the ground from the tray and waits until I pick them up and put them back for another round. The trays will be more useful once he begins self-feeding. I really like that the seat cushion is easily removable and machine washable. The 3 point safety harness is also a must have feature because squirmy babies and a highchair equals potential falls. I do have to note that the structure is not as sturdy as I would like but as it's not really a toy and as long as I keep Kenzie from climbing on it often, it is durable for the purpose. Mason enjoys sitting in his highchair for dinnertime and for the price - you can't beat this highchair. Mason also received the Nursery Center in Insignia print. It was compact when I pulled it out of the box but a bit hefty in weight. However, the assembly was super easy and it was ready to use pretty quickly. I set it up as a regular play yard first and it is going to be nice once Mason starts crawling and pulling up for him to have a safe place to play in. The portability factor is fabulous as this can be kept at grandma's house since she primarily watches him during the work week. The bassinet portion had bars to keep it sturdy which I liked. The pad is cushy yet firm. Mason liked to look at the mobile which Kenzie wound up for him. The music is a bit short but as long as Kenzie is nearby he will be fine. The diaper stacker is a bit thin but it holds diapers and wipes fine. I like that there are wheels at the base of this playard. It's easy to move from room to room at the inlaws (since their home is larger than ours). I also like how the design and colors are soothing and not glaringly baby. 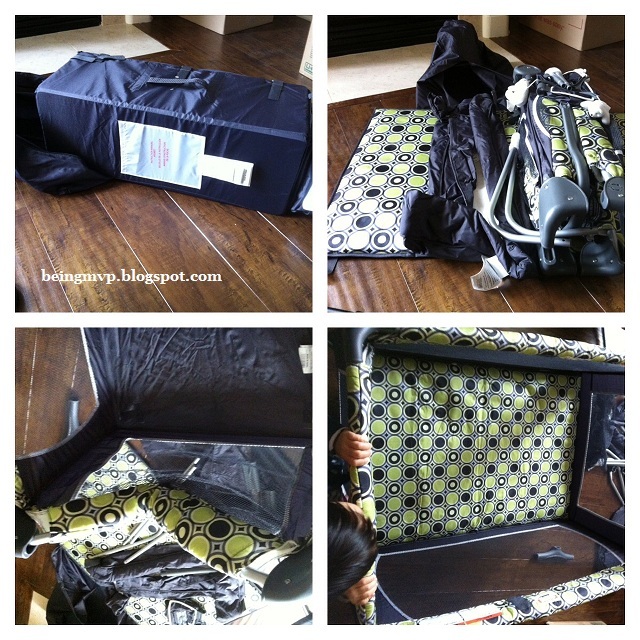 The changing table is perfect for when you don't want to rush to the nursery. This is especially important since Mason's nursery is on the 3rd floor! The safety straps are easy to use and the surface of the table is wipeable. As you can see from the photo, Mason is a wee bit large for this but the changing table seemed to support him well. It flips out so you can have full access to the bassinet without removing the table and you can flip it back when you need to change a diaper. This play yard is for newborns up to 30 lbs or 35". Mason is about 20 lbs so he still can use this for some time. Buy It: You can purchase the Trend High Chair - Evergreen for $109.99 and Nursery Center Playard - Insignia for $99.99. Big boy is maxing out that bassinet! So cute. Yes definitely a neat feature! I really like this, I wanna get one of these for my baby! I love how the high chair folds up for storage. I love the basket underneath the high chair. Such a simple idea but so smart! Wish ours had that. You little one looks so long in some of these pics. 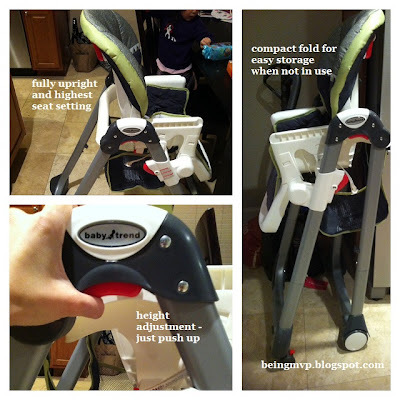 I love the high chair it has so many great features and the portable play yard is a great thing to have especially if you plan on taking any trips. It is much better to bring your own play yard if possible. The hotel ones can be very dirty. This is going to sound awful, but I had no idea play yards had weight limits. It of course makes sense, and I should probably check out our two. Though DD is barely 20 lbs, so we're probably find, since I'm going to guess 30 lbs is pretty standard. Did the mobile come with the play yard, or was that yours already? I always forget ours when traveling, and it makes bed time so much more difficult. That would be great to have one as part of the play yard. Now the real question... how difficult was it to pack back into its travel case? Yes the mobile is included and it was very simple to repack! Literally minutes :) The hardest part is taking the mobile apart to fit in case. Ok, I have never seen a high chair go down so low! That is a really nice feature! thank you - I love reading reviews on highcahirs - we have one i hate!!! 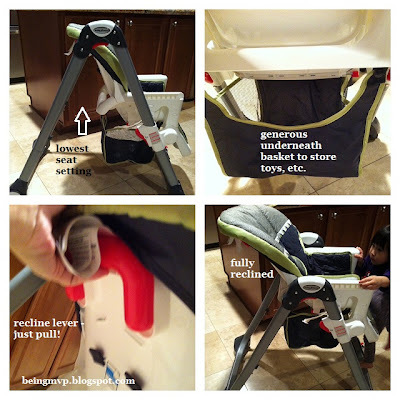 Love the compartments on the highchair tray. I love the different sections on the tray of the high chair! Great product! I really like the high chair, I have been looking for a new one so I will have to check this one out more. How wonderful! I love that is folds up and you can store it so easily. 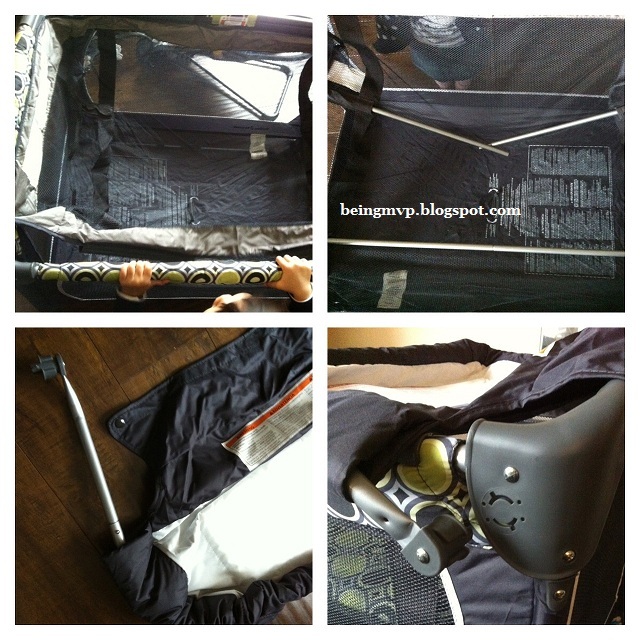 I also love the pack and play, it is so versatile. Thanks for sharing. I love how flexible these are - really well thought out design. I love the fact you don't need tools to put it together. It would take forever in my house to find all the necessary ones so that's a plus in my book for easy assembly! Very nice set! A new mommy would have it all with this set. Thanks for sharing.